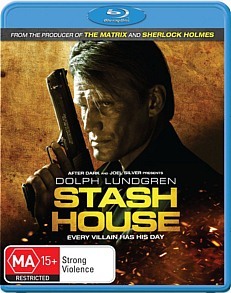 Stash House Blu-ray Review. Stash House is hampered by a couple of fairly glaring plotholes, but still manages to pull out all the stops in its efforts to entertain. It’s fast-paced, bombastic and completely unrestrained - everything a good action flick should be. I was always a big fan of Dolph Lundgren growing up, even if his career never really approached that of his 80s action star brethren and in hindsight he could perhaps most aptly be characterised as the poor man’s Jean-Claude Van Damme. Van Damme, as I see it, was the poor man’s Sylvester Stallone, which makes Steven Seagal the poor man’s Dolph Lundgren. Schwarzenegger of course ruled the late 80s/early 90s action movie fiefdom, and I’m not really sure where Bruce Willis fit in. At any rate the hulking Swede’s performances in films such as Rocky IV and Universal Soldier still hold up nicely in my book, and it’s good to see him enjoying a belated JCVD-style career resurgence of his own. Continuing his recent return to form in outings such as Universal Soldier: Regeneration, The Expendables and The Killing Machine, Dolph here stars as - you guessed it - a big lumbering baddy with a penchant for large-calibre firearms and figure-hugging denim. Stash House is directed by Eduardo Rodriguez, heretofore best known for his well-received short films, and boy does the man know how to wring every drop out of a budget. Combining elements of surveillance drama and crime thrillers like Panic Room into its action motif, the film is a hardworking and stylishly shot affair that does its darndest to keep you glued to your seat until the very end. Essentially a frenetic and explosion-ridden exercise in violent one-upmanship, Stash House revolves around a young couple, Dave and Emma, who move into their dream home in the suburbs. Upon arrival however they quickly discover that the security-heavy home also contains another unexpected feature: dozens of bricks of heroin hidden inside the walls. Even worse for the couple, the thugs whom the stash belongs to want it back, and they aren’t inclined to ask politely. Stash House is hampered by a couple of fairly glaring plotholes, but still manages to pull out all the stops in its efforts to entertain. It’s fast-paced, bombastic and completely unrestrained - everything a good action flick should be. A short (7:29) Behind the Scenes featurette, consisting mainly of interviews with Rodriguez and the principal cast members. Big Dolph features prominently.